The Collaborative Research Center 716 "Dynamic Simulation of Systems with Large Particle Numbers" of the University of Stuttgart developed the basis, methods and tools for the research of scientific particle simulations and adapt them for the increasing requirements of industrial applications. On 6th December 2018, the SFB was declared to be closed until 31th December 2018 at its last membership assembly, after twelve years of funding by the Deutsche Forschungsgemeinschaft (DFG). The Visualization Research Center was part of the Collaborative Research Center 716 with its subprojects D.3, D.4 and D.5 and was responsible for the visualization of simulations of moleculardynamics. The speaker of the SFB 716, Prof. Christian Holm, Institute for Computional Physics, took the oportunity to look back on the last year of funding and thanked the members from 15 institutes of the university for their extraordinary cooperation. The SFB 716 looks back on a successful interdisciplinary DFB funding project with many cooperations, scientific results and publications as well as numberous PhD thesis. 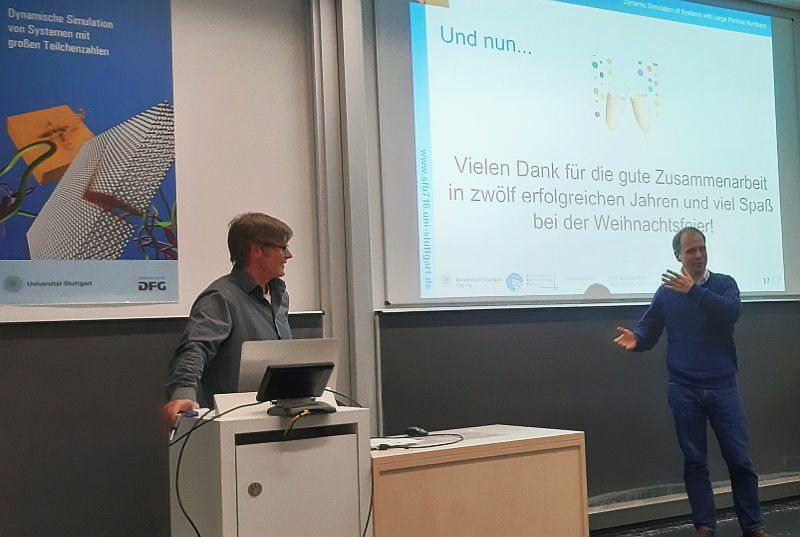 Photo: VISUS; from the right: Project leader Prof. Johannes Kästner, Institute for Theoretical Chemistry, thanks the speaker Prof. Christian Holm for his long-term leadership of the SFB 716.